Speaker Paul Ryan have history. 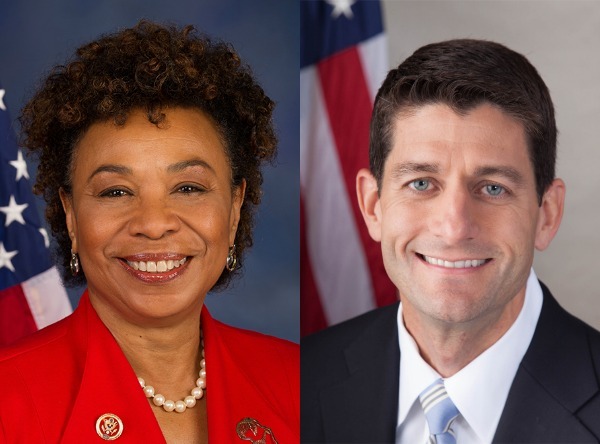 CONGRESS | DISTRICT 13 | “I congratulate Paul Ryan on his election as Speaker of the House today,” East Bay Rep. Barbara Lee said Thursday of the new Republican House leader. In the statement, Lee encouraged Ryan to act against an Authorization of Military Force (AUMF), in Iraq and Afghanistan, currently on the speaker’s desk. Lee famously voted against the first AUMF in Afghanistan following the 9/11 attacks. But, while she was gracious in her congratulation of Ryan to succeed Rep. John Boehner, the two have politically tussled in the past. In March 2014, Lee seized upon comments made by Ryan asserting absent black fathers were to blame for some “inner city” ills. Nevertheless, history aside, few can imagine Lee–one of the most progressive members of Congress–and Ryan, a devout fiscal conservative, will ever see eye-to-eye. Posted in AUMF, Barbara Lee, congress, house speaker, inner city, Iraq, John Boehner, paul ryan, race, Republican. Bookmark the permalink. Barbara Lee is one of the most important and prominent members of the Scamsocratic Party. However getting back to Barbara Lee specifically, since Barbara Lee is not merely a leading “liberal” in the leadership of the Scamsocratic Party, but is even a member of its craziest and sleaziest branch, in other words the Scams FraudsFIXso area branch, therefore she is an unusually strong believer in an “improved” version of “free speech,” in other words that no one should be allowed to say anything that might hurt the tender and sensitive feelings of the phonies who pretend to be liberals. In regard to phonies, parasites, scam artists, charlatans, and demagogues, but who pretend to be great liberals and wonderful humanitarians, I forgot to mention John Edwards and the Clintons, and which was unforgivable. In fact any list of the foremost phonies, scam artists, charlatans, and demagogues of the last several decades that did not mention John Edwards and the Clintons would be as ridiculous as a book on the most prominent generals of the US Civil War that did not mention Ulysses Grant and nor Robert E. Lee, or a book on major Western Alliance political figures of World War Two that did not mention FDR, nor Churchill, and nor Stalin.